Cloud Banks, the new exhibition by Mark Amerika at Kasa Gallery, will coincide with another of Mark Amerika’s exhibition titled Precipitations at the Museum of Contemporary Cuts, continuing the aesthetic analysis of the theme of Art and Economics. 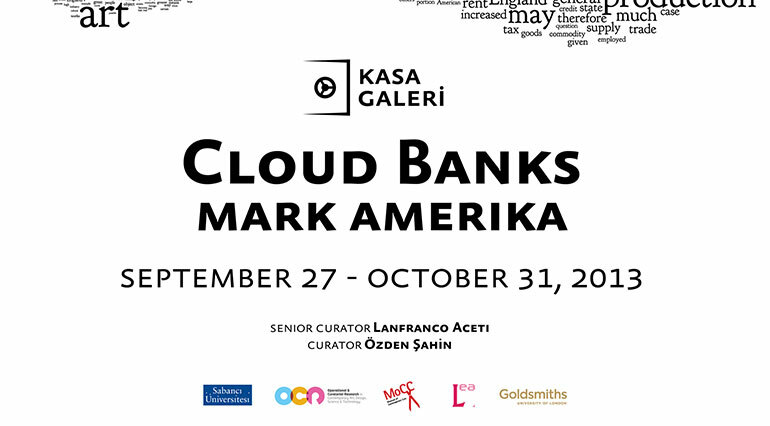 Cloud Banks at Kasa Gallery will explore the way artists, political and economic theorists, metaphysical philosophers, and businessmen use language as a tool to construct their vision of the world as they see it. As with much of Amerika’s conceptual net art, the title is a pun, one that refers to both a weather phenomenon – a layer of clouds seen from a distance – and the recent rise of both cloud computing and too-big-to-fail banking systems. Amerika has taken numerous texts from authors such as Immanuel Kant, John Ruskin, P. T. Barnum, Andy Warhol, Raoul Vaneigem, Karl Marx, John Stuart Mill, and various documents produced by Conceptual artists of the 1960s, to produce experimental tag clouds that reveal both the writer’s use of language and the thematic subjects they obsessed over. Amerika then cleverly manipulates the tag clouds by mashing up some of the texts for aesthetic and political effect. For example, in the show at Kasa Gallery, two of the works on exhibit mashup Conceptual art documents with John Stuart Mill’s Principles of Political Economy out of which emerge a subset of tag clouds titled Conceptual Art Mill. This post-structuralist and postmodern approach to contemporary art introduces multilayered issues on the blending of image and text that create a series of relationships indicative of the current struggle to preserve old definitions and hierarchies, which are increasingly unable to explain the current socio-political upheavals in an economic context that is increasingly deteriorating. Amerika’s textual juxtapositions oblige the viewer to read and re-interpret the meaning that the visual proposes in light of instinctive word associations. This is not solely an exercise of ‘viewing’ but a conceptual re-interpretation of textual historical inheritance, ideological arguments and conflicting realities. Clouds obscure and diffuse the light of the sun, much as banks obscure and confuse the effects of contemporary financial realities. The clouded visuality of the words in Amerika’s artworks becomes a way to let the viewer perceive the clouded visuality of the world. Cloud Banks is the representation of a human failure to understand, reconnect and re-contextualize histories, ideologies and contemporary realities. Mark Amerika’s work becomes more than a conceptual collage: it is a hymn to human failure, to the impossibility of seeing as the viewers’ gaze is obscured and obstructed by the ‘cloud banks’ that surround us. This is a world of undecipherable constructions, contradictions, multiplicities and vagueness. A world of tenuous connections that, by impeding a clear vision, leads the viewers into abuse and exploitation. Senior Curator: Lanfranco Aceti. Curator: Ozden Sahin. Exhibition Dates: September 27 – October 31, 2013. Mark Amerika’s work has been exhibited internationally at venues such as the Whitney Biennial of American Art, the Denver Art Museum, the Institute of Contemporary Arts in London, and the Walker Art Center. In 2009-2010, The National Museum of Contemporary Art in Athens, Greece, hosted Amerika’s comprehensive retrospective exhibition entitled UNREALTIME. He is the author of many books including remixthebook (University of Minnesota Press, 2011 — remixthebook.com) and his collection of artist writings entitled META/DATA: A Digital Poetics (The MIT Press, 2007). His latest art work, Museum of Glitch Aesthetics [glitchmuseum.com], was commissioned by the Abandon Normal Devices in conjunction with the London 2012 Olympics. Amerika is a Professor of Art and Art History at the University of Colorado at Boulder and Principal Research Fellow in the Faculty of Humanities and Social Science at La Trobe University. More information can found at his website, markamerika.com and at his twitter feed @markamerika.